Bunches of fresh grapes are a common sight in American grocery stores, but the Produce for Better Health Foundation reports that most grape varieties originated in other areas of the world. One of the few fruits native to North America, Concord grapes provide a rich flavor and color to grape juice, jellies and wines, and research shows that the antioxidants in these tiny fruits help to prevent chronic diseases. According to the Dr. Bruce Reisch, a professor in the Department of Horticulture at Cornell University, Concord and seedless Concord grapes look and taste similar, but the two varieties are not related. The skin of the Concord grape releases easily from the flesh, making it a slip-skin grape variety. If you need to quiet a sweet tooth, 1/2 cup of Concord grapes contains only 30 calories, 0 grams of fat and only 7 grams of sugar. Concord grapes provide a small amount of fiber, 0.8 gram per cup. The Produce for Better Health Foundation reports that 1 cup of Concord grapes contains only a small amount of vitamin C, 8 percent of the recommended dietary allowance. One cup of grapes has 13.4 micrograms of vitamin K, a critical nutrient for blood clotting. The Institute of Medicine recommends 90 micrograms of vitamin K a day for most adults, and 1 cup of grapes provides 15 percent of this recommendation. Concord grapes do not provide a significant amount of iron, calcium or zinc. Concord grapes provide flavonoids, powerful antioxidants that may decrease your risk of heart disease. Many studies used Concord grape juice or extract, but fresh grapes provide the same antioxidants. A study published in 2000 in the “Journal of Medicinal Food” compared the antioxidant function of Concord grape juice and orange juice. The study found that Concord grape juice had stronger antioxidant activity and reduced the effect of LDL, or bad cholesterol, in the blood. A study published in 2001 in “Circulation” showed that antioxidants from purple grapes, such as Concord varieties, decreased platelet function, which may lower the risk of a stroke or heart attack. Preliminary research suggests that the antioxidants in Concord grapes may protect against cancer. A study published in 2010 in the “Journal of Food Science” discovered that Concord grapes inhibited angiogenesis, a natural process that makes new blood vessels from existing vessels. Angiogenesis supports the growth of a baby during pregnancy and recovery from injuries, but it also grows new blood vessels to feed and metastasize a cancerous tumor. Concord grapes may also boost your immunity. A study published in the “Journal of Medicinal Food” in 2011 found that participants who regularly drank Concord grape juice had more white blood cells in their bloodstream than participants in the control group. 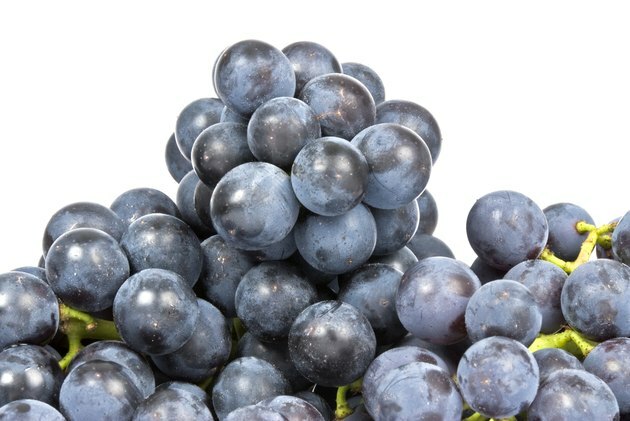 Doctors do not recommend eating grapes or drinking grape juice as a treatment for cancer or any other condition, but eating Concord grapes as part of a healthy diet may provide health benefits.